Conveniently located, 2 bedroom 1 bath, luxurious basement apartment. Gorgeous Newly Finished Basement Apartment ~ You're Going To Love Staying Here! Your summer vacation oasis awaits! Come stay in our newly finished 2 bedroom, 1 bathroom, basement apartment and enjoy a private salt water swimming pool. Our property is family friendly and includes: Separate entrance and parking for your convenience. Lots of windows for natural light. All high end finishes: custom kitchen cabinets, granite counter tops, stainless steel appliances, new hybrid mattresses, 65" Flat screen with Hulu, Netflix, and Sling to stream all the latest entertainment. All beds have brand new Restoration Hardware bedding. Apartment is professionally cleaned before each visit with environmentally friendly cleaning supplies. 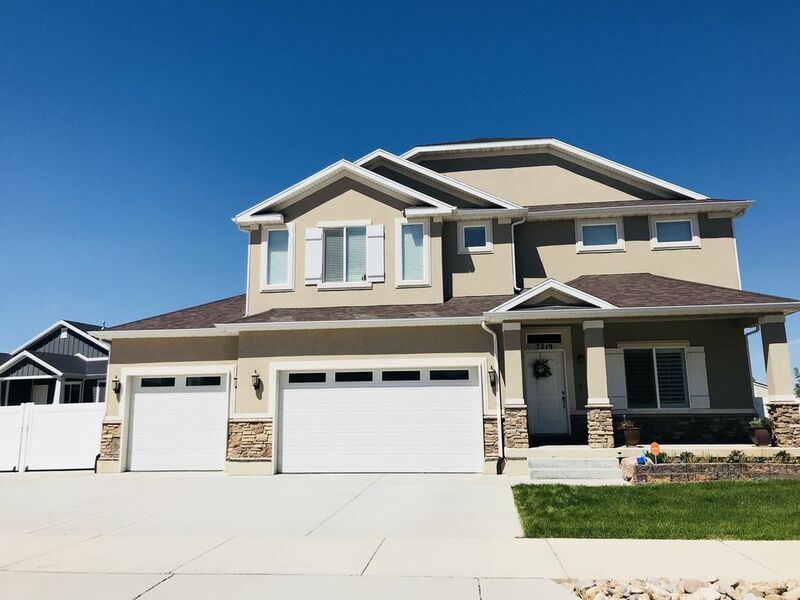 Located just minutes from Hill Air Force Base and Weber State University. Quick, easy access to lots of outdoor recreation: Snow Basin resort is a 10 minute drive, Adams Canyon is right up the road, 15 minutes to Lagoon amusement park, and Salt Lake International Airport is just 30 minutes away. Home is monitored by Vivint security. There is keyless entry to apartment with entry codes changed between guests for your peace of mind. Traveling with a baby? We’ve got you covered with: a pack n play, stroller, playmat, and high chair available upon request. The best part of this house is the in ground, private, heated, salt water swimming pool! Pool towels provided. Yard is fully fenced for privacy and security. The pool has a motorized pool cover to keep the pool securely closed when not in use. Pool is only for guest use when you stay at our property so you can enjoy privacy. I have been a world traveler and lover of hotels and vacation properties for most of my life. I'm happiest hopping onto an airplane to start a new adventure. I have lived in: Nebraska, Colorado, Idaho, Utah, California, Spain, and Russia. I have been traveling with my children for 16 years and I appreciate the conveniences of staying at a VRBO property. I love families and kids and wanted to create a space that caters to their needs. Double sink vanity with Corian countertop. Bath/shower combo. Dedicated off street parking spot. Brand new kitchen! Granite counters. Stainless steel appliances, custom soft close cabinetry. Williams-Sonoma dishes. Toaster, Keurig coffee maker. All the conveniences of home. 65 inch brand new LG 4K TV. Hulu, Netflix, Sling available. If you’re traveling with young children we have lots of toys available to use. Towels provided. Swim at your own risk. Pool is 18X40 with a 9 1/2 foot deep end. No running near pool. No glass allowed near pool. Pool has an electric pool cover only opened by owners. Nice, modern very clean. Would go again. Worked great for the 5 of us to enjoy skiing. Nice place. Well equipped and nicely put together. Booked this accommodation last minute and was a bit skeptical renting a basement apartment. Actually turned out great. Had plenty of lighting and the place worked out great for our family. The place is well put together and nicely stocked with the items we needed for our family of 6. If there was something needed that wasn’t there the homeowner was quick to respond and very responsive texts and phone calls. All in all it was a great place to bring my family together for the Christmas holiday. This is our second stay and we highly recommend this apartment to everyone looking for a home away from home. Clean, quiet, spacious, convenient and homey. The space was just what we needed - the kitchen & laundry - super convenient. We loved the salt water pool, and the house was on a quiet cul du sac. Her books, toys, linens, and towels were a perfect addition. She was available by text, most anytime, and helpful w the pool. It was clean and well take care of. We would stay here again. The space is lovely. The pool was lovely. The host was incredibly responsive. It was like having a personal concierge. I can't recommend it enough! This property was perfect for my husband, 2 young children, and me. The rental is impeccably clean. The decor is modern and very pretty, but not fussy. I let my children move around the rental and play without worry. The kitchen is stocked with essential kitchen equipment and appliances that allowed us to cook our meals. The bedrooms are spacious. All beds are wonderfully comfortable. My children settled in for bed without pause. The bathroom is clean and easily accommodated my family. The owners are friendly. I truly appreciate the owners’ thoughtfulness. The rental is stocked with plenty of supplies, including towels, soaps paper products, and other items that are unexpectedly needed when away from home. My children loved finding toys to play with as well as books to read. The neighborhood is nice and quiet. We took advantage of the location as it is conveniently located to shopping areas, restaurants, tourist sites, resorts, and Salt Lake. The rental felt like home. We would definitely rent this property again. Thank you so much for your kind words! We love our renters and strive to make each stay comfortable and enjoyable. We are located near Hill Air Force Base and Weber State University. Snow Basin ski resort is 7 miles away. Lagoon Amusement Park is 11 miles away. Salt Lake International Airport is 30 minutes away.